The Solanaceae Family has been highly cultivated over the years - it includes potatoes, tomatoes, eggplant, sweet peppers, chili peppers (but not black pepper), tobacco and petunias. Some plants have great medicinal value, some are quite poisonous. The calyx and corolla are 5-lobed, and usually there are 5 stamens. The fruit is partitioned into 2 or 4 seed-producing divisions, and may be dry or a fleshy berry. Identification of the nightshades can be really confusing - the same plant, when keyed out, will often lead to two different identities. Two species are definitely known on Montara Mountain: Forked Nightshade (Solanum furcatum) and Blue Witch (Solanum umbelliferum). These are covered in the entry Solanum sp. (Nightshades) which also holds the images I couldn't tie to one species but show traits common to all. Flowers: White to white-lavender to pink/blue, with yellow centers; five petals sometimes bent back tomato-like, in branched or single loose racemes or umbels. Leaves: Triangular, gently lobed or toothed, sometimes smooth; in pairs. Fruit/Seeds: Small green - black balls. Location: All trails and areas. Status: Alien Inavsive or Native - Common. Note the swept back petals, with distinct lavender marks and yellow centers on clustered flowers; this could be S. furcatum with a different coloring variation, or it might not. 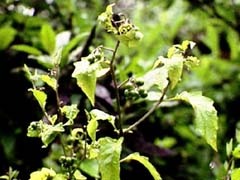 The Native and Alien species of nightshade are very similar. Patches near residential areas are very often one of the european varieties. Hairy Nightshade (S. sarrachoides) (Alien) is , well, hairy with yellow fruit. Flowers: White to white-lavender with yellow centers; five petals bent back tomato-like, usually in double-branched, loose racemes or umbels. Leaves: Triangular, gently lobed or toothed, in pairs. Status: Alien Inavsive - Common. Note the swept back petals and yellow centers on clustered flowers. Caution: This plant is Poisonous. Further description & Comment: Bushy growth, 2 - 4 feet tall. Some plants in damp, sheltered spots will bloom as early as January. The forked feature is easiest seen later in the year when the berries develop on the distinctly forked pedicles. Plants that seem frustratingly similar but "not quite right" are covered in Solanum sp. (Nightshades). Flowers: On top of stems; purple- blue with yellow centers, six petals with a little spike on the tip of each. Closes up at night. Up to 1 inch across. Leaves: Dark green, oval, untoothed. 1 -2 inches long. Fruit/Seeds: Green balls, hanging in clusters. August - September. Caution: This plant is Poisonous! Further description & Comment: 1 - 3 ft tall; shrubby. Green stems with small, forked hairs. S. xanti (or Blue Nightshade) is a central California relative sometimes found in the Bay Area. S. dulcamara (sometimes called Bittersweet) is a european variety with blue flowers similar in shape to Forked Nightshade (Solanum furcatum).